In any seminar on the Indian economy, the discussion invariably turns to the savings rate in our system. The savings rate – the percentage of savings to national income – is around 32-34 percent system. Contrast this to the savings rate of less than 10 percent in the 1960s. This is taken note of, and then the experts (coincidentally most of them are from Delhi and usually ex-IMF/World Bank wizards) will bombastically conclude that the savings rate should increase some more to give a further boost to the economy. Then they will inevitably criticise “unproductive” investments undertaken by households in buying gold, which is substantial and increasing over the years. 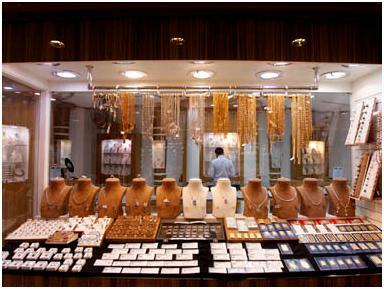 India is one of the largest buyers – nearly one-third – of gold in the world. More than 90 percent of this is for jewellery purposes. In the table ( see below) accompanying this article, we have given details on the purchase of gold by different countries. In recent years, the attraction of smuggling has come down due to a liberalised import policy. 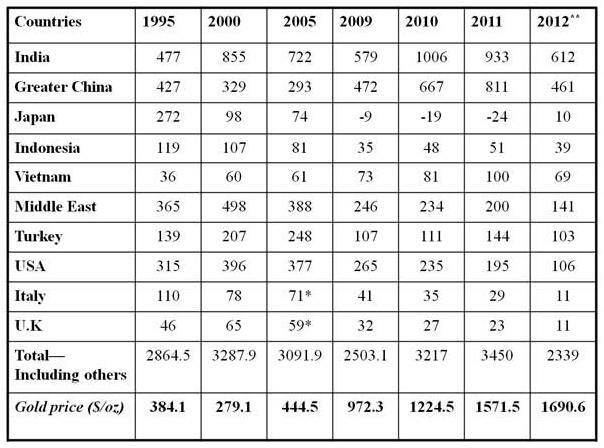 Incidentally, domestic production of gold is very negligible, running into a few tonnes. The purchases made in Saudi Arabia and the Gulf states are also mostly by people of Indian origin – and to that extent the actual Indian demand for gold is much higher. What is bought in the Gulf this year by non-resident Indians (NRIs) reaches Indian shores next year. At an average price of, say, Rs 20,000, for 10 gm (now much higher) we can estimate that more than Rs 2,00,000 crore (1,000 tonnes) has been spent by Indians in buying gold last year. This is four times the aggregate capital raised from the stock market. Interestingly, the purchase of gold by households is not treated as savings in our statistics. It is treated as consumption by a household. This is curious, as households themselves treat the purchase of gold as “investment,” never mind what economists in government think. The “experts” are more or less unanimous that households, particularly women, are making “unproductive” investments in gold jewellery. They would rather have households invest in government bonds which can be used to pay salaries for government employees (the most “productive” activity apparently!). But why do households invest in gold? It is not for return but for security. Gold is a major form of social security for a large number of Indian households which do not have any other. Nearly 90 percent of India’s workforce, particularly the self-employed, are not covered by any retirement scheme. They require economic security for old age. The problem is more acute for the wives of the self-employed, as they do not have independent access to income or savings. Even if they work, it is used for current consumption. In the poorer segments, a good portion of the income of the man could be used for drinking, gambling, etc, and hence not much is left as savings for old age. The joint family system is breaking down and so the traditional support models are getting weakened. Under the circumstances, it is but natural that the Indian woman would like to own some assets which are useful in the later years, or in case of any other eventuality. Real estate is relatively costly, not divisible and not portable. Gold ornaments are portable and divisible. A chain can be converted into two bangles and one can own the smallest nose ring or ear stud, unlike land. Transfer of ownership is also very easy. In the case of gold ornaments, one can say that possession is ownership. In other words, if a mother removes her chain and gives it to her daughter, then it belongs to the latter by tradition. One can get loans against gold by pledging it with a moneylender any time of the day or night, seven days of the week. The millions of moneylenders actually function like manual ATMs in our country; they act as money vendors with the personal touch. In other words, gold represents the most liquid form of asset in India. One can also say that gold is the most politically correct metal which can be owned. In traditional Indian families, sometimes shares or fixed deposits are disposed of without the knowledge of the housewife. But gold is always sold with the concurrence or knowledge of the housewife. The so-called superstition about retaining the mangal sutra till the death of the spouse acts as an insurance/protection to the woman against rapacious children. It is assumed that gold ornaments will work as social security for her in case of major emergencies or after the death of the head of the household. Bollywood blockbusters of yesteryears invariably had a scene where the heroine (or her mother) removes her bangles or chain to be pledged for the benefit of her ailing husband or son – and it did reflect the ground reality better than the views of experts. To re-emphasise: Gold is the most liquid, portable, easy to transfer asset. It acts as social security and insurance for middle- and low-income group women. Currently, we have a division of labour in our ruling dispensation between two rapacious groups. One is the NAC headed by Sonia Gandhi which dictates terms for outlandish social schemes intended to obtain votes. Another group owes its intellectual allegiance to the IMF. Their knowledge of India is acquired in Washington and they try to find ways to help Anglo-Saxon interests while furthering the dubious schemes of NAC. Our finance minister is jittery because government finances are in a shambles and the fiscal deficit could be more than 10-11 percent if you include central/state/government companies and local authorities. He is concerned about the current account deficit as well as the fiscal chaos. He cannot find any meaningful solutions and so he eyes the gold with households. Gold is seen as an unproductive asset, but this is untrue as it is extensively used as collateral in small businesses. The banking sector meets only 30 percent of the credit requirements in the retail trade; the rest comes from non-bank institutions, including money lenders. They all use gold bangles /necklaces/studs, etc, as collateral. This government is considering launching a diabolical plan to give totally useless government paper to housewives in lieu of their gold. It also has plans to hike customs duties to make gold costlier to import. A committee appointed by the Reserve Bank of India (RBI) has come with some exotic suggestions. Few of them will work. After the 1962 China war, the then government banned gold imports and that single foolish act gave rise to the Dawood Ibrahims of the world to make a killing from smuggling. Somebody should tell the IMF/World Bank eminences that gold is not price sensitive in India – unlike their home countries in the Europe and USA. So if the finance minister bans its import or hikes rates, we will create more Dawoods, unless the government has some understanding with Pakistan on this! It would be best is to create a regulator for non-bank finance companies, including money lenders, since neither the finance ministry nor RBI has any clue on this sector. If they had any sense, they would be taking a lead in the global gold markets since we buy more than 30 percent of the global output. We are similar to Wal-Mart in this area. In the domestic market, we should encourage the use of gold as collateral for small businesses in an orderly fashion. The government needs to recognise that gold is an asset for women – and the majority of men may not even know how much gold is there in their homes. If the current account deficit is increasing, the government should reduce unwanted imports of super luxury goods for Page Three people; if the fiscal deficit is out of control then the government should close down the NAC and scrap their hare-brained vote-buying schemes. But the government should not touch the gold in households or temples. They are her assets, and Goddess Lakshmi won’t be pleased if they are touched. Dear Sir, you have tried to drill some common sense into World Bank oriented mandarins and our own west looking FM. I hope they understand. While the women from India’s poor households may have invested in gold now as a measure of security, perhaps she is not aware that the price oof gold may go down. It is only naturally to assume that gold cannot sustain 31000/10g forever. In such a case isn’t she better served to have her money in a bank (though I agree that the poor have limited access to India’s banking system). Infact, this should be taken as a opportunity to develop India’s banking sector to be more inclusive and free these women from the clutches of the money-lender who often charge inexrobitant interest rates even after taking gold as collateral. Statistics suggest that India’s import of GOld has actually come down thanks to an import levy earlier this year – the current accunt deficit could have been much worse. A few years ago I would have whole heartedly supported the argument of buying gold because it was affordable and there was a realistic possibility of its prices going up. Now the rural poor anyways has to pay a high price for a metal which she thinks is precious but in all likelihood be beaten down in price by the international market. That is a major concern. When did Gold’s price went down significantly in the last 50 years in India ? In fact, it has beaten almost everything except (may be) real estate. Compared to Gold, the returns from bank deposits, stock markets etc. have given peanut returns.. Besides, when consumer inflation is in the range 12-15% and the same with food inflation, it is stupid to put your money in bank deposits which gives 8-9% returns before tax. Indian housewife is well advised by the elders\ age old wisdom to put money in gold than keeping with the useless paper money. As long as the central bankers and wall street fraudsters try to cheat people of their money with inflation and currency debasing, Gold’s price will only increase..
Gold is undervalued to the factor of dozens today even at 3,000Rs/gm(present price). Gold is the true world currency not the US garbage dollar or any other paper currency. Even your fiercest enemy will accept gold in lieu of some product or service. Try buying even a chocolate in any other country apart from India with paper RBI notes. If gold does become increasingly unaffordable even for yearly purchases the masses must move on to the next best asset i.e Silver. Silver will gives even better returns than Gold!!! If many years later even Silver becomes unaffordable people must start investing in other semi-precious metals like copper or tin. Metals are universally valued and cannot be printed by corrupt governments. Metals are divisible, fungible, and hence the best form of money compared to say diamonds or gemstones. As a side note the word Rupee comes from ‘Raupya’ in sanskrit which means silver. Rupee=Silver. Period. Rupee cannot become paper or plastic if corrupt governments say so. Sir, I have a query which is off the topic but related to Gold. Can RBI come up with direction for bank to take gold and start providing interested to the customer on the gold. that way more people will put gold in the bank to earn more and then bank will get a new form of asset to put as a collateral to get more paper money from RBI. This will help in converting gold into equivalent physical money and can be use for productive output. I too have some concerns regarding the greedy money lenders and gullible housewives. However, the problem is not with gold, but with the lack of standardization and education. It is a good thing for banks and RBI to come up with some standard about Gold loans to ensure that the women are not cheated.